Why would I need self storage in Patchogue, NY? There are a variety of reasons why you might need self-storage in Patchogue, NY. How much is a storage unit in Patchogue, NY? The cheapest storage unit in Patchogue, NY is $78.00 per month. What size storage units do you have available in Patchogue, NY? In Patchogue, NY we have sizes that range from 5'x5' to 15'x20' to suit your storage needs. How much is it for a 5'x5' storage unit in Patchogue, NY? The cheapest 5'x5' storage unit in Patchogue, NY is $78.00 per month. Patchogue is a mid-sized village in the town of Brookhaven, New York. Part of Greater Nassau-Suffolk, Patchogue lies 12 miles east of Brentwood and 50 miles east of New York City. It's population has been fairly steady for several decades, with a large number of families and young married couples calling the village home. Many believe Patchogue's name honors the Patchogue Indians who lived in the area before the arrival of European settlers. Others suggest Patchogue comes from a Native American term meaning where they divide in two. Patchogue was officially incorporated as a village in 1893. Its economy grew on the back of a strong lace manufacturing industry before the village became known as a summer resort. Image via Flickr by Melissakis, H.
Although Patchogue is a fairly small community, it can swell substantially during tourist season. 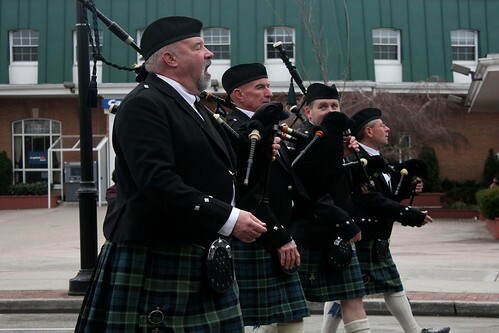 Visitors are attracted to its riverfront and harbor areas, local parks and annual events including the Great South Bay Music Festival and St. Patrick's Day parade. It's home to the only commercial brewery on Long Island, the Blue Point Brewing Co. The Patchogue Theater for the Performing Arts is another popular establishment, hosting live performances, community gatherings and educational seminars. The village has a small town feel, yet it's just a stone's throw from the hustle and bustle of New York City. This has made it popular with people looking for a quiet suburban life within easy reach of big city amenities. It also has a strong economy and living costs relatively affordable for the area. Students in Patchogue attend public schools that belong to either Patchogue-Medford Union Free School District or South County Central School District. There are a few private schools in the village, mainly faith-based and associated with local churches. Utilities: Major utility providers in the Patchogue area include PSEG Long Island, the Long Island Power Authority and the Suffolk County Water Authority. Garbage and Recycling: The village public works department facilitates twice-weekly trash collection and recyclables pick-up every other Wednesday. Transportation: The Suffolk County Transit system operates several bus routes through Patchogue and neighboring communities. Patchogue has many historic homes, with more than a third of local properties built before the 1940s. This gives Patchogue's residential areas a historic charm not seen in many U.S. regions. A small number of properties built in the 21st century are available for homeowners with more modern tastes. The median home price in Patchogue is well above the national average, but fairly in line with comparable communities in the area. Our lowest priced units in Patchogue, NY average $78.00 per month. 58 people have reserved units in Patchogue, NY in the past 30 days. There is 1 location within Patchogue, NY's city limits.